Vinod grew up dreaming of being an entrepreneur, despite growing up in an Indian Army household with no business or technology connections. Since age 16, when he first heard about Intel starting up, he dreamt of starting his own technology company. Upon graduating with a Bachelors in Electrical Engineering from the Indian Institute of Technology, Delhi, he failed, at age 20, to start a soy milk company to service the many people in India who did not have refrigerators. He came to the US and got his Masters in Biomedical Engineering at Carnegie-Mellon University. His startup dreams attracted him to Silicon Valley where he got an MBA at Stanford University in 1980. Upon graduation he was one of the three founders of Daisy Systems, which was the first significant computer aided design system for electrical engineers. The company went on to significant revenue, profits and an IPO, but Khosla, driven by the frustration of having to design the computer hardware on which the Daisy software needed to be built, started the standards based Sun Microsystems in 1982 to build workstations for software developers. At Sun he pioneered “open systems” and RISC processors. Sun was funded by long time friend and board member John Doerr of Kleiner Perkins Caufield & Byers. In 1986 he switched sides and joined Kleiner Perkins where he was and continues to be a general partner of KPCB funds through KP X. There, through the years, with other partners, he took on Intel’s monopoly with Nexgen/AMD (the only microprocessor to have significant success against Intel, sold to AMD for 28% of AMD), incubated the idea and business plan for Juniper to take on Cisco’s dominance of the router market, to formulate the very early advertising based search strategy for Excite, and to transform the moribund telecommunications business and its archaic SONET implementations with Cerent (sold to Cisco for $7B), and many other ventures. He helped in creating value, having fun, succeeding, failing (remember Dynabook?) and driving impact in partnership with entrepreneur, and the partners at KPCB. 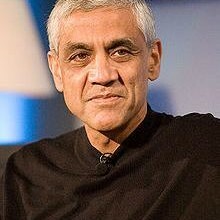 In 2004, Khosla, driven by the need for flexibility to accommodate four teenage children and a desire to be more experimental, to fund sometimes imprudent “science experiments”, and to take on both “for profit” and for “social impact” ventures, formed khoslaventures, funded entirely with family funds. His goals remain the same – work and learn from fun and knowledgeable entrepreneurs, build impactful companies through the leverage of innovation, and spend time as a partnership making a difference. He has a passion for nascent technologies that can have a beneficial effect and economic impact on society.